Irrfan Khan was spotted at the airport and this time he did not hide from the shutterbugs. 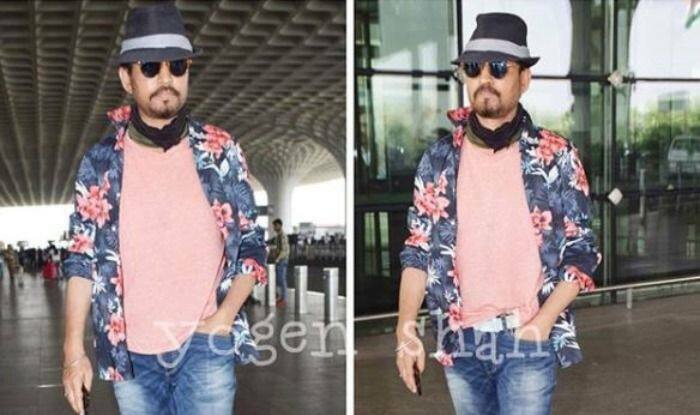 Irrfan Khan who has been batling cancer was recently spotted in Mumbai airport. The actor was keeping himself from the paparazzi but this time he did not shy away from appearing near the shutterbugs. He first hit his face with a black scarf but soon pulled it down and posed for the paps. Irrfan was spotted at Mumbai airport in the early hours of Tuesday. The lower half of his face was first covered with a black mask, but he later removed it for the paparazzi. “Irrfan was leaving for Rajasthan for personal work,” a source in the know told IANS. Irrfan was last seen in Karwaan with Mithila Palkar and Dulquer Salmaan. There has been a buzz that Irrfan will soon start shooting for the sequel to his 2017 film Hindi Medium, opposite Kareena Kapoor Khan in London. Reports suggest that Kareena will be playing the role of a cop in the film. An earlier report in Mid-Day quoted a source close to the development as saying, “While the film kicks off in April, Kareena will join the unit only by May-end during the London schedule. She will be seen as a cop in the satire. while she loved the script, Kareena was just as excited to play a police officer for the first time in her 19-year-long career. She intends to wrap up the sequel by November, in time to begin shooting for Karan Johar’s period drama Takht”. This is the first time Irrfan and Kareena will be seen collaborating on a project.